This honey chipotle chicken is SO good! I added Tomato, Cucumber and Avocado Salad as a side and it was the perfect quick & easy weekend dinner. It was an easy and delicious dinner I made last Saturday for me and my husband. I know you will love this one, and nothing beats an easy summer dish that takes less than 30 minutes to make. This is one of those lazy days, couldn’t be easier dishes. You just season the chicken breasts with salt, freshly ground black pepper, garlic powder and a little bit Chipotle powder seasoning. Cook the chicken over medium heat on the stove for about 5 – 6 minutes on each side. After chicken is done, brush each chicken breast with the honey chipotle glaze. It’s easy peasy, I told ya! And the flavor of this chicken is terrific! Do you have a favorite lazy day chicken recipe? Rub the chicken with olive oil, season with salt, freshly ground black pepper, garlic powder, and 1 Tbsp Chipotle powder seasoning. I like to rub the chicken with a little bit of olive oil because it helps keep all the juices in the chicken and the chicken stays tender & juicy. Reduce heat to medium and place chicken in skillet. Do not overcrowd the skillet. Work in batches if necessary. Cook chicken over medium heat for about 5 – 6 minutes on each side. While chicken is cooking, mix the juice of 1 lime, honey, and the other 1 Tbsp Chipotle powder seasoning. After chicken is done, place it on a plate and brush with the honey chipotle mixture. You can serve it with your favorite side of vegetables, over mashed potatoes, rice, quinoa or top a big green salad. Easy and delicious Honey Chipotle Chicken tossed in a sweet and spicy honey chipotle sauce that is to die for! Quick 30-minute dinner. Reduce heat to medium and place chicken in skillet. Do not overcrowd the skillet. Work in batches if necessary. Cook chicken over medium heat for about 5 - 6 minutes on each side. Holy moly girl! This looks amazing! Honestly, I’ve been a little lazy about dinners since the weather has heated up…lots of salads and sandwiches. lol But this a quickie that I must try. Thanks! I have all the ingredients. I am mking this tonight! 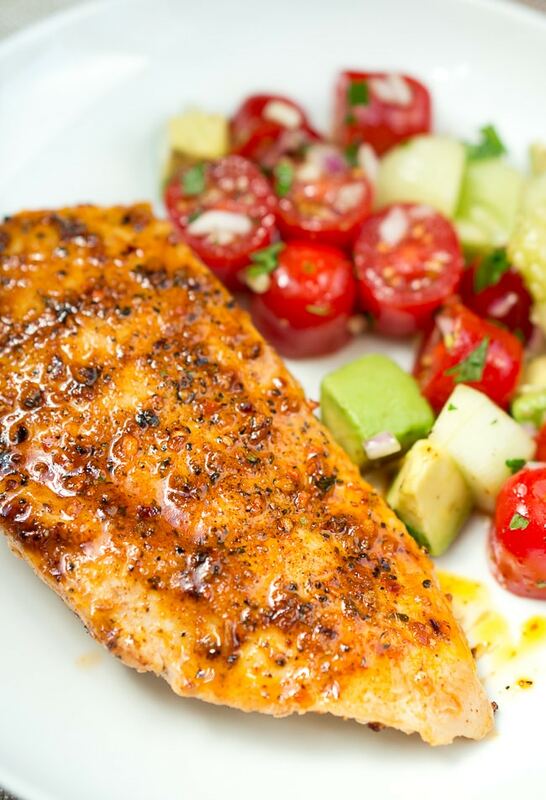 I love the beautiful sear and glossy glaze on that chicken breast, looks absolutely yummy! I love your blog and would like to invite you to become a Chicory recipe partner (check us out at chicory.co). Are you interested? This sounds delicious and looks beautiful, chili works so well with honey, beautiful simple! 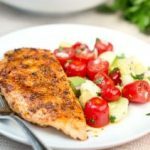 I love healthy chicken recipes! Adding this to my July menu! We eat a lot of chicken in our house, always looking for new and healthy ways to make it! Definitely gonna use this recipe! I love anything chipotle… would love to try this! Wowza!! That glaze on the seasoned chicken has me drooling 😀 We love honey chipotle flavors, can’t wait to try this one! Love how easy this is! And, it looks so good. Really love this flavor combination – sounds delicious! I love the color this gives the chicken–not only do I know this is delicious but it really looks appealing! The recipe calls for chipotle to be rubbed on to the chicken. In addition chipotle is added to the sauce. Is the 1 tablespoon of chipotle in addition to the amount rubbed into the chicken? if so how much chipotle do you rub on the chicken? This sounds delicious but just need clarification. Hi Pam! yes, 1 Tbsp chipotle powder for the sauce is in addition to the amount rubbed into the chicken. I just updated the recipe. I love the EASY addition of flavor here. So often “lazy” = plain and boring or loaded with preservatives or sugar. My favorite lazy dinner starts with pre-cooked poultry sausages, like those from Brat Haus or Applegate. Is chipotle chili pepper the same this as chipotle powder? Honestly, I am not sure. But I think it should work. Beware of the spice! I can’t believe no one else has commented on how much chipotle chili powder is in this recipe. I am a spice lover but this is OVERWHELMING. The amount of spice needs to be cut down to about a fourth of what is listed here, if not less than that. Chipotle chiles are really hot and this honey chipotle glaze has good flavor but is WAY spicy. Hi Abby, first, I am sorry yours turned out too spicy! I used McCormick’s chipotle chile powder–I didn’t know there was such a thing as chipotle powder seasoning. I’ll have to look for that and/or cut down on the amount of chile powder next time because I do like the sweet and spicy combo. Thanks so much. Yes, I love that spicy-honey combo a lot too! You can probably still substitute the seasoning with less chili powder and mix it with other spices. You can go by taste and adjust it to your own liking. I was going to say the same thing, way overwhelming on the chipotle, couldn’t taste any other flavors. I used the McCormick gourmet chipotle Chile pepper. I’ll probably make the recipe again but use way less of that seasoning. Stephanie, the chipotle Chile pepper is not the same as the chipotle powder seasoning. It is way spicier and you should use just a pinch or two. I believe I used the chipotle powder seasoning from McCormick’s Grill Mates product line. Norma, I use just enough garlic powder to season the chicken breasts on both sides. Also, about 1 -2 Tbsp oil to rub the chicken breasts on both sides, and another 1 Tbsp for sauteeing the chicken in the skillet. Hope this helps. Enjoy your dinner! could this be made in crockpot? I haven’t tried to make it in a crockpot because it’s very easy and quick to cook on the stove. But you could probably do it in a crockpot, especially if you are making a large batch of chicken. Going to try this tomorrow! What is your recipe for the veggies shown with the chicken? Or did you just put them all together? Hi Leah, the veggies on the side are from this tomato cucumber & avocado salad. Very quick & easy to make. I have everything but lime…can i substitute lemon juice for citrus? Also, i dont have the chipotle one, but Im going to try the spicy ranchero seasoning, seems to have many similar ingredients! Hi Jill! Yes, you can substitute lemon juice for lime. It might not taste quite the same, but i am sure it will still taste delicious. You could substitute with another spicy seasoning but you have to adjust it to your own taste. It will depend on how spicy the other seasoning is. Add a little bit at first and taste to see if you like it and if you need to add more. Hope it turns out fantastic! 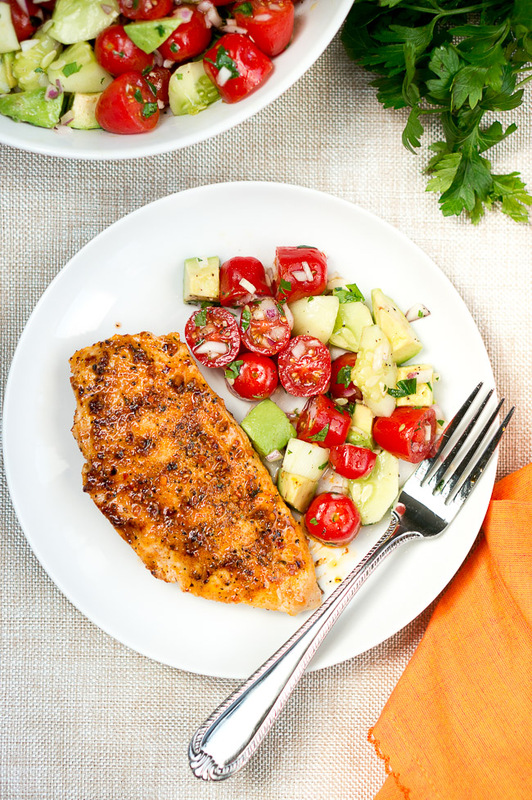 The chipotle seasoning use in this recipe is not the same as using chili powder. I would recommend you get the chipotle season is very good!